Every painting starts here, but where is here? Each paintings of Ma Yinxin has the image of the window. Some are appeared in distant view so it may not be a major factor, however, most of them are full of odds and ends inside the window. Other series depicting really quite alone window of picture. Window is the starting point of watch, and, too, the finishing point of it. And painting itself is a doorway leading to the visual appearance of something or someone. The first time I saw these “upper of construction” paintings of Ma Yinxin, I felt I had never seen these buildings before. Although, in fact, they were not strange to me, but these symbolic images in Ma Yinxin’s painting provided plentiful and specific information which represented collective idea and equalitarianism under typical socialist ideology. The same kind buildings went further to make a connection between factory-hand’s life and work: as a home place, it was at the one hand the rewards of their work; on the other hand, it encouraged people to work day after day. These highly intensive space were also seen as a dwelling place for their body and soul. This was why people continued to flock to this city, and an opportunity to meet some of them who had called this city home for a few decades. But now, their memories of the happy and peaceful life remain in a particular state, the road to another side from home is disconnected. In Ma Yinxin’s childhood, he witnessed the workers were making a good living and were contented, each in his building. But, once he steppedinto his manhood, began to have the ability to understand the world around him,he found that these constructions belonged to state-owned enterprisehad gradually put away by society and times. People’s believe of an era overlapped with Ma Yinxin’s childhood, and now, they are labelled eye-catching mark in his heart. Though Ma Yinxin was brought up here, he was lucky to have studied art of painting at university. The way he had learned the traditional artistic technique, as same as other conservative education method, was in order to maintain a stable power of radition. In any society, an ordinary man will have a chance to break away from his original stratum once he get hold of manual skills. But, the intelligentsia, of knowledge and special skill, do not belong to the bottom class, and is also opposite to the upper class. The intellectual independence can make one observe attentively, from an outsider’s point of view, to which he is not only pay attention to his own fate but also concerns of others. His knowledge and personal position help him to look again at the social structure of the superstructure while focusing on the bottom class. 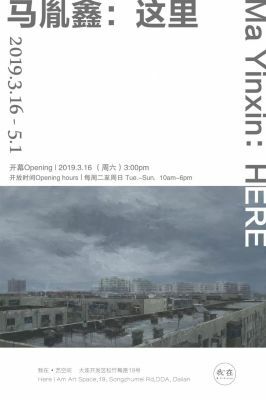 Ma Yinxin’s painting forms a mixture of symbols, images, post-industrial society, aesthetic autonomy, and individual expression; it is the representation of era, art history, individual experience by safely using media tools. In fact, artist’s work and his studio are the opposite of popular culture. He is an observer in the distance, or least, a partaking in observer. He’s neither involved in the tide of pop culture, nor defending the value of traditional artistic technique passively. He never throws out any hasty questions, as he knows that haste is no use of solving problem. And, asking clear questions can help one get closer to the solution and become the confident person one’s always wanted to be. As same as Ma Yinxin claims: “What is the purpose of painting? That, after all, is haze. To start or to end such practice takes more of courage.” He has tried to differentiate varieties of doubts through his real but simple paintings, so as to point out his accurate questions. Therefore, he is approaching the issue in a practical way.